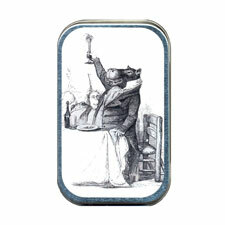 We've taken our toasting hippo image and applied it to a new silver colored tin the size and shape of an Altoid mint tin. Tins measure 3 3/4" long and 2 1/4" wide with a depth of 3/4". Hinged lid. Food safe. Email us for larger quantities and special pricing!